How can I participate in course evaluations? How do I access the course evaluation system? Can I submit my own course-specific questions? Can I match a student’s comments with their answers to other questions? Can I download the results for multiple courses at once? How can I increase response rates? Department chairs will receive a message from Jenna Swanson early in the semester with a listing of all courses that meet eligibility requirements for course evaluations, which they will use to indicate which courses will be evaluated for the semester. Instructors will then receive a listing of their courses to indicate which courses they would like to volunteer for evaluation. If you have any questions about which courses are scheduled to be evaluated, please contact IRT . Please check the course evaluation schedule for the full list of dates. 1. Login to the Course Evaluations website using your BearID and password. 2. Login to Canvas using your BearID and password. 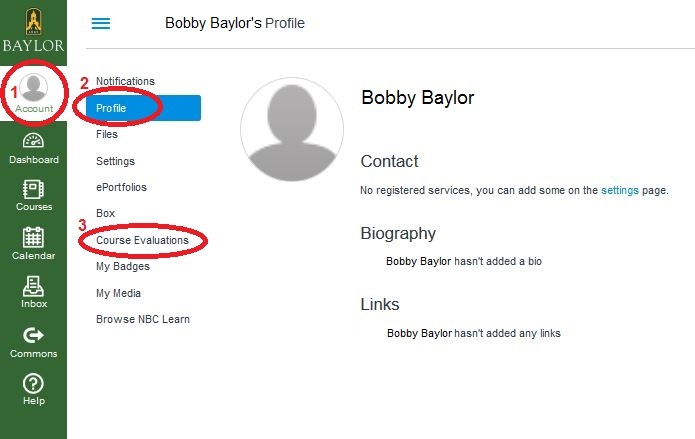 Select "Account", "Profile", and "Course Evaluations" from the menu on the left side of the page. This is an option within the EvaluationKIT software that we intend to use during future semesters for specific courses. We currently offer the ability to add up to five additional items for all courses within the department. For more information regarding adding items, please contact IRT. Yes. One of the report options is ’Raw Data’ which is in Excel format. This file contains record level data for each respondent including comments, so you can match a student’s comments with how he/she answered the other questions. Please note that there is NO identifying information for any respondent, so you will not be able to identify which student sumitted each response. Results for all evaluations will be available after the deadline for grade submission each term. Instructors will be notified via e-mail when the reports are available. See below for a short step-by-step illustration of how to log in and access your response rates and reports. For more extensive information about reporting features, tutorials are available on the EvaluationKIT website. Yes. You have the option to download the results for each course individually, or you can create a batch report to combine the results for each individual course into one PDF or .zip file. You can select the courses to include in the report by course number or instructor. See the "Accessing Course Evaluations" documents above for more information. Include the evaluation period (2-3 weeks before finals) in course syllabi. Remind students to check their Junk and Clutter folders for any Course Evaluation reminders. Ask students to be on the lookout for emails from course_evaluations@baylor.edu. Emphasize the significance of course evaluations and let students know that their responses matter. Monitor and communicate course response rates to students during class. Remind students of the gift card incentive. Students who complete all end-of-semester course evaluations (including science labs) will be entered into a drawing for 1 of 50 $25 e-gift cards to Amazon. Schedule time in a computer lab or during class when students can use laptops or tablets to complete electronic evaluations. Important note: Just as with paper evaluations, if class/lab time is set aside to complete evaluations, instructors must leave the classroom while students complete evaluations. During the evaluation period, give an assignment or exam through Canvas so that students are reminded to complete evaluations through pop-ups. Encourage students to use the single sign-on link: www.baylor.edu/course_evaluations. Provide incentives (for example, points toward a participation grade) for students who complete the evaluations. Or, if not for individual students, provide incentives for entire classes that receive a 100% response rate. Each student receives a confirmation email after he or she has completed each course evaluation. Students may print this confirmation email and share it with instructors as proof that they have completed the course evaluations. Or, the Institutional Research and Testing office can assist students with verification that evaluations have been completed. Have classes complete electronic evaluations at the beginning (as opposed to the end) of class. Instructors can show the overall response rate for an entire class through Canvas using an overhead projector and computer. Response rates are displayed in real time, so, as students complete evaluations, the rates go up. Some instructors have been successful by telling students that they will move forward with class once the response rate reaches 90-100% (depending upon absences). Note: Once again, in keeping with the University’s long-standing practice with course evaluations, faculty must leave the classroom while evaluations are being completed.